First, a confession: Although I’m familiar with the life and antics of renegade “gonzo” journalist Hunter S. Thompson, I’ve never actually read any of his work. It’s an education gap I hope to correct soon, but in the meantime, at least I have The Rum Diary, the latest screen adaptation of a Thompson title and the latest characterization of the man by his longtime friend Johnny Depp. In 1998’s Fear and Loathing in Las Vegas, a 35 year-old Depp played Thompson circa 1971, when the writer’s intoxication was at a peak of sorts (he seems to have had several peaks). Now almost 50, Depp here gets to explore a much younger version of Thompson named Paul Kemp. I doubt any other actor could make that age gap as negligible as Depp does here. 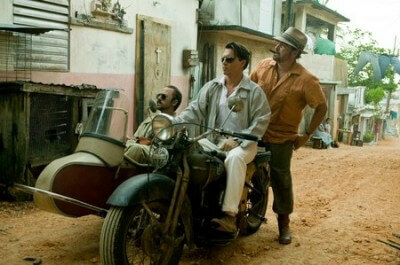 The Rum Diary is a fictionalized account of Thompson’s formative time at a daily newspaper in Puerto Rico. In the film, Kemp is hired at the San Juan Star, a gutless rag that seems always on the brink of ruin. Fortunately, almost everyone at the Star can hold their liquor as well as Kemp, so he has plenty to do in between horoscope column deadlines. This is a misanthrope’s coming-of-age story: boy meets world, boy sees injustice, boy gets angry. The poverty in Puerto Rico gets Kemp thinking, but it’s after meeting a real estate developer named Sanderson (Aaron Eckhart) that the rage begins to solidify into a point of view. More of a small-time imperialist than a businessman, Sanderson plans to empty a nearby island of its natives and fill it with hotels. He wants Kemp to type out some propaganda to make it go down more smoothly and offers to pay him well. But like the writer who spawned him, Kemp is an uncompromising kind of guy. Either you join the bastards, as he calls them, or you die fighting them. Even if the congealing of Kemp’s disgust isn’t as coherent as it needs to be, and although his bold pronouncements feel hopelessly simplistic, there’s plenty to enjoy here; most notably, the enjoyment comes from these characters and the actors who bring them screaming to life. In particular, there’s Giovanni Ribisi’s Hitler fanboy Moburg and Michael Rispoli’s marvelously disheveled photographer Sala. Director Bruce Robinson’s (Withnail & I) approach to the booziness of the material reminds me of the title of comedian David Cross’ 2009 book, “I Drink for a Reason.” These guys get loaded and go on adventures, but their drunkenness is a product of sheer desperation. In other words, the film is funny, but these guys aren’t having any fun. Probably the least appealing proposition after seeing the film is the idea of sharing a drink with Kemp and Scala. With that in mind, it’s slightly miraculous that this movie comes off feeling as light and purely comedic as it does. I suspect it may be a little tame for the Thompson cult, but there’s something irresistibly engaging about The Rum Diary.